One of the biggest challenges for publicly traded companies is their “obligation” to meet quarterly results. It’s unfortunate, because companies can potentially be perpetual entities, and to have to manage to a quarterly number often leads to myopic decision making that leads to poor long-term performance. On the other hand, if a company is implementing a transformational change that will create shareholder value over the long run, but will cause the company to miss quarterly numbers, the stock will get hammered. Not only is the company playing offense against rivals Amazon, Target (TGT) and Costco (COST), it is also taking on hip start ups like Blue Apron (NYSE:APRN) and established omni-channel retailers like Williams Sonoma (WSM). The expansion of the grocery business puts Walmart on a collision course with Amazon (NASDAQ:AMZN), which is nothing new, but certainly adds yet another dimension to the competition. The interesting thing is that Amazon started as an online retailer and is moving to bricks and mortar while Walmart is doing the opposite. I’m certain the optimal business model is somewhere in the middle. Walmart is expanding its online grocery business. It will use personal shoppers and third-party delivery services and customers can either have them delivered to their home, for $9.95, or swing by an outlet and pick it up without even getting out of the car. This service should be available at 2,200 stores by the end of the year, which includes more than 40% of US households. And the Walmart promise of everyday low prices applies to online orders too where prices are the same as those in the store. Walmart currently has more than 18,000 personal shoppers that go through a rigorous training program designed to help them select produce and meat for either delivery or pick up orders while the previously mentioned fee applies to a minimum order of $30. We’re serviing our customers in ways that no one else can. Using our size and scale, we’re bringing the best of Walmart to customers across the country. For busy professionals or families who prefer to eat out or cook “efficiently,” the company has rolled out meal kits to 2,000 stores and made them available through its online grocery delivery service. This service will compete directly with Blue Apron and will likely cause a shift in the balance in subscription-based meals toward grocery retailers. Walmart’s meal kits range from $8-$15 for two people, compared to Blue Apron, with prices starting at $9.99 per serving. And if that’s not enough to make Blue Apron subscribers switch over, Walmart also launched a new line of cookware products by Buzzfeed’s Tasty, which can be used to prepare either meal kits or one of the several thousand recipes provided by Tasty. The launch of its own exclusive cookware brand touches on the strategy used by Williams Sonoma, which sells its own brands sold exclusively in-store or through the company’s own website. Like Tasty viewers, our customers are looking for inspiration and want to have a little fun in the kitchen. Through our unique partnership, we’re making it easier than ever to do that. Customers can now shop for all of the items featured in a recipe on the Tasty app through Walmart and prepare a delicious meal using our new Tasty cookware. – Steve Ronchetto, Vice President, Cook and Dine, Walmart U.S.
What’s the big deal with meal kits? 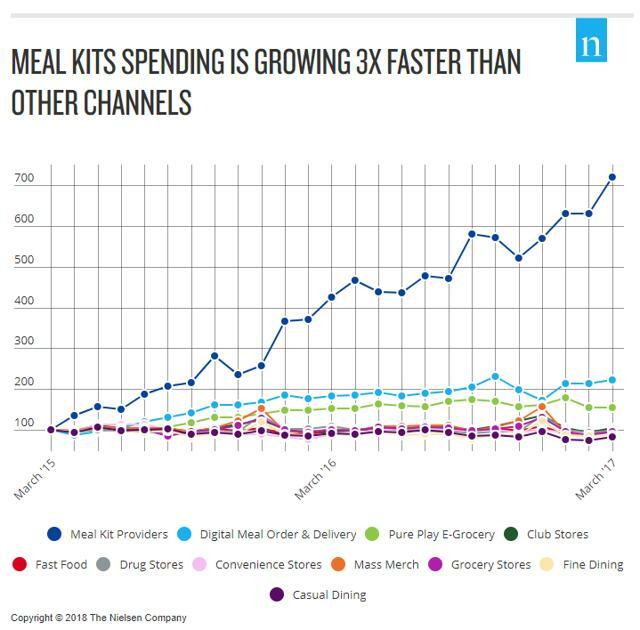 Whether it’s a fad or not we won’t know for some time, but the facts are that meal kit spending has been growing three times as fast as other food retail channels. The advantage for grocery retailers like Walmart compared to Blue Apron is that Walmart can shut that business down relatively easy if the trend reverses, but Blue Apron is done if that’s the case. Walmart also launched four new apparel private brands. These new brands enhance Walmart’s apparel category and makes its product selection more stylish at a still low price. Acquisitions like Bonobos and ModCloth bring unique, private-branded products to the customer shopping experience. In addition, partnerships like the agreement with Lord & Taylor will help create specialty experiences that complement the assortment with more brands customers want. With all the talk of Amazon taking over the world, it’s not hard to realize why we tend to forget just how big Walmart is. Walmart revenues reached $500 billion in 2017, compared to $177 billion for Amazon. Net income? Walmart had three times the net income of Amazon. And free cash flow was $18 billion compared to $6.5 billion. In other words, the fear instilled in others by Amazon may just as easily come from Walmart. It’s somewhat ironic to say that Walmart, with its massive size, is going through growing pains. But it is, particularly as it relates to its online business and new ventures into groceries, private branding, etc. I believe investors punishing the stock for an earnings miss is just at short sighted as company management focusing on quarterly earnings in lieu of long-term shareholder value. There are some challenges, however. Analysts say the Jet.com site isn’t reaching consumers outside urban areas, making its 40%-plus online sales growth forecast optimistic. 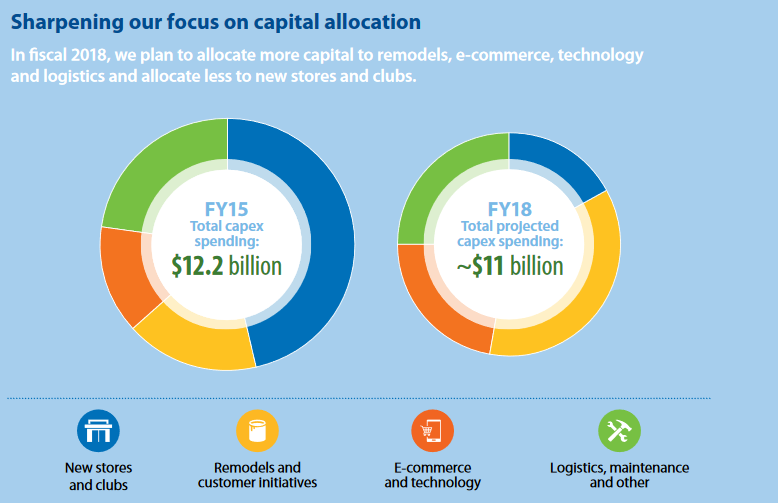 But Walmart says it’s shifting its strategy to focus more on its flagship website and will lower spending on Jet. It will incorporate Jet’s smart-cart technology into its e-commerce operation to potentially capture greater unit sales – a result that Jet’s technology has been able to drive. There also are challenges related to the bullseye on its back for being the single largest non-government employer in the world. Recent actions may alleviate some of the pressure from activist and labor groups. It paid more than $1 billion in February and March to their hourly associates in addition to their previous salaries. They also are increasing the minimum wage to $11 and expanding maternity and parental leave benefits. On February 1, the company also implemented an adoption assistance benefit of $5K per child. I’m starting to wonder if I shouldn’t have interviewed with the recruiter back when I was graduating with an MBA. Walmart’s operating margin also has been steadily decreasing over the past three years and the retailer reported a 5.6% decrease in its operating margin at the end of fiscal 2017. However, Walmart’s operating margin (TTM) of 4.48% beats the industry average of 3.65% and it remains greater than Costco’s operating margin (TTM) of 3.17%. The EBT margin has been declining for the past four years and this is partly due to its strategic shift. Capital spending has declined slightly from 2015 but also shifted from new stores and clubs to remodels, customer initiatives, and e-commerce. It has already introduced facilities like “in-store pickup,” “same-day pickup” and “mobile checkout.” It is further testing novel concepts like “digital shelves” for ensuring stock availability. Some of the Walmart stores have been equipped with smart devices that not only help customers search the right products but also enable them to order an out-of-stock item. The company has begun to deploy in-store robots that move around to check incorrect prices, missing price tags and out-of-stock merchandise. As for margins, process automation is just one of the factors that will help Walmart with its operating expenses while logistics will continue to play a greater role in achieving operational excellence as customers have begun to prefer “same-day” and “on-demand” delivery models. To sustain its cost competitiveness, Walmart has begun to scout for logistics partners that will help it to curb “last mile” costs in the urban markets. It is already well known for its state of the art transportation and infrastructure system so the last mile is the “cherry on top.” Recently, it acquired Parcel, a startup logistics company, to offer same-day delivery to its customers in New York City. The benefits of these initiatives may not be realized quickly as the costs of reengineering are high but again, the long-term looks promising. What’s not to love about the company? Its boring, low-cost strategy may be the primary reason why it still may not be viewed as a technology company – yet its competing against Amazon, which although is in the Consumer Cyclical sector is still included in the infamous FANGs and has a bit more cache than an old stalwart like Walmart. Is it cheap? Probably not, but comparisons to history are somewhat irrelevant. I’m not saying that a PE multiple of 27 looks reasonable for Walmart. Its five-year average PE multiple is 16 and I would certainly prefer to buy it at a PE of 16 than 27. 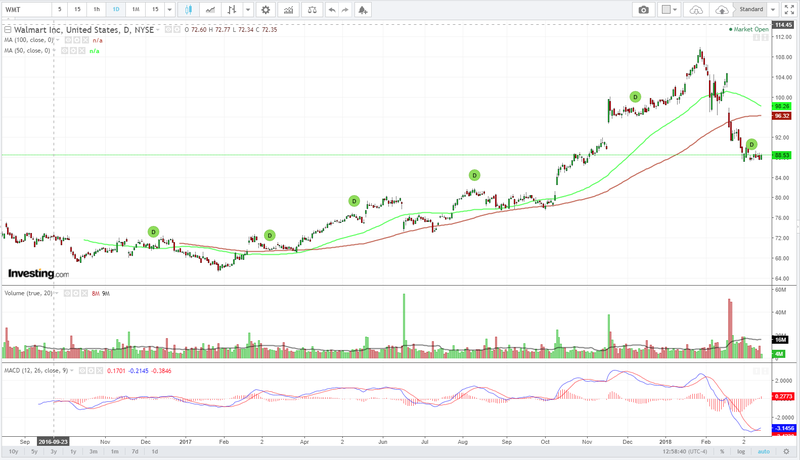 But at a forward PE ratio of 18, it starts to look interesting. Part of the big spike in the PE multiple was due to a decline in EPS (see above), and analysts are forecasting $4.93 EPS for 2019. While analyst consensus price target is $105, our price target is closer to $118. 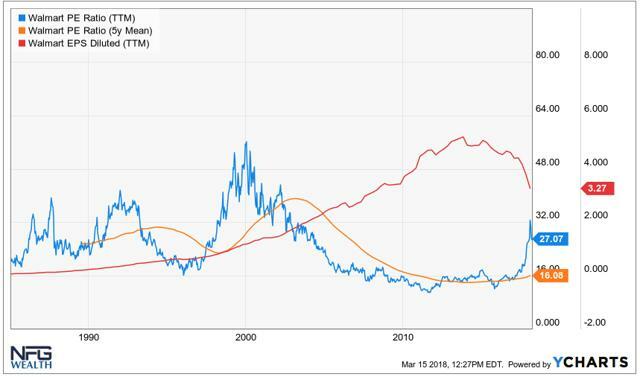 While long-term investors should worry less about entry and exit points, we believe this is a good entry point for short-term investors attempting to time their investments. Walmart also pays a 2.4% dividend yield, which of course, Amazon does not. But to be clear, I’m not suggesting that Walmart is a better investment than Amazon, I only draw comparisons to bring to light that Walmart is no slouch and that Amazon’s dominance of so many other retailers doesn’t apply here. Quite the opposite perhaps, as Walmart begins to encroach on Amazon’s turf. Disclaimer: Please note, this article is meant to identify an idea for further research and analysis and should not be taken as a recommendation to invest. It’s intended only to provide information to interested parties. Readers should carefully consider their own investment objectives, risk tolerance, time horizon, tax situation, liquidity needs, and concentration levels, or contact their advisor to determine if any ideas presented here are appropriate for their unique circumstances. Check out a free trial of ROI Here. Disclosure: I/we have no positions in any stocks mentioned, but may initiate a long position in WMT over the next 72 hours. Previous Previous post: SA Roundtable: How Are Dividend Investors Handling Volatility?